Guest blogger @ivieanne joins the Light Side in our Virtual Star Wars Half Marathon Blog Hop to discuss the fun social happenings during Star Wars Half Marathon Weekend at Disneyland. Here's everything you need to know about Meet Ups, tweetups and #alltheselfies! runDisney race weekends are so awesome awesome because of the people. Some of these people are friends that you see from race to race, some are friends in various Facebook or social groups that you have virtually trained with and some are people you follow on social media and hope to meet IRL (in real life). Here are some runner meet ups happening throughout Star Wars Race weekend, so get your camera ready. Kickoff the weekend with the runDisney Instagram meet up (#rdIGmeetup). This series of meet ups started when a group of Instagram "friends" who loved running disney decided that they should meet up in person. 7 meet ups later, it's fun to see the group grow each time. 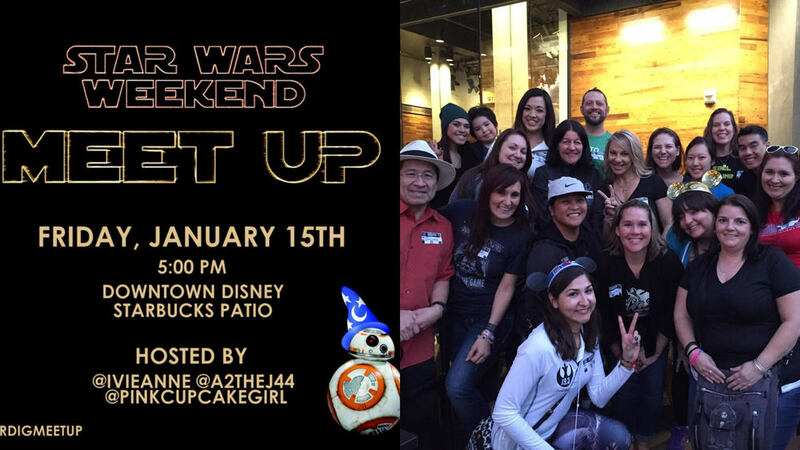 Located on the patio of Starbucks in Downtown Disney, the meet up begins at 5:00 pm and is hosted by @ivieanne @a2thej44 and @pinkcupcakegirl. Group photo will be at 5:30 pm so be there! It's fun to go to a meet up early in the weekend so you can see familiar faces through the courses. Everyone is invited and no RSVP required! 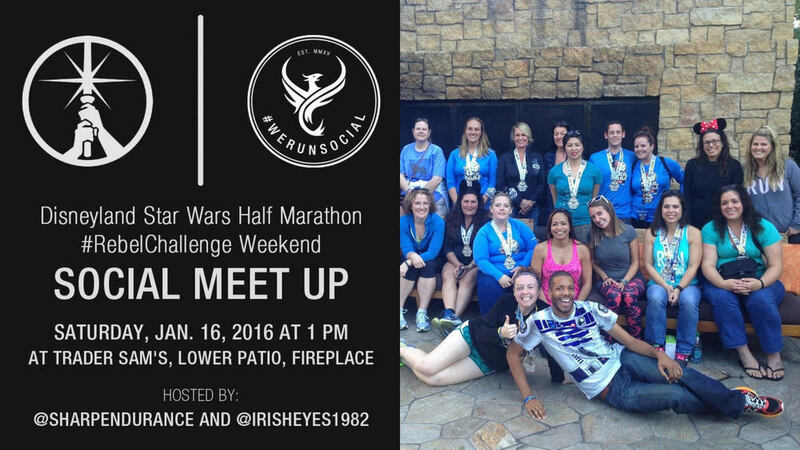 Next up on Saturday is the Disney STAR WARS CHALLENGE Facebook Group meet up! With almost 1,000 members in this group, these meet ups are always full of familiar faces and lots of laughter. Hosted by the den mama herself, Lyn Paulos, the group will gather at the Official Picnic Area outside of the security tents on the Downtown Disney side. The meet up will start at 3:00pm and get there fast to get your official wrist band from Lyn. These wrist bands are so cool! They help you identify other people from the group through the weekend. Although I have not seen anything official on the Team #runDisney Facebook page, there are usually pre-race morning meet ups. These are usually around 4:30am under the sorcerers hat at the Disneyland Hotel. Keep your eye out on the Team #runDisney Facebook page for official meet ups and times. The running community truly makes every event memorable, but the runDisney community takes it to another level. These people know how to have the most fun, take the most selfies and give the BEST hugs. There may be more meet ups through the weekend, so keep your eyes out on all social platforms for invites! This gives everyone a chance to get to know more running friends through race weekend. The more people you meet, the better your race weekend will be! Huge thanks to Ivie for joining us in our Virtual Star Wars Half Marathon Weekend Blog Hop. Be sure to check out the other writers' posts for more galactic tips and tricks. Happy Anniversary to Us & Happy New Year to ALL!